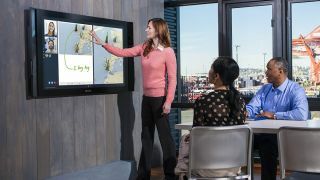 Whitlock has announced that the company is among the leaders in worldwide Surface Hub sales. As a Microsoft Gold Communications Partner, Whitlock demonstrates the highest level of expertise in implementing Microsoft UC solutions, including Microsoft Surface Devices, Skype for Business, and Office 365. Company experts can also advise on technology roadmaps, cloud solutions, and network readiness for new video or UC implementations. Whitlock is also a founding member of the Global Presence Alliance (GPA), a team of companies delivering solutions jointly around the world for video and unified collaboration. Together, Whitlock and GPA members have sold hundreds of Surface Hubs since its launch last year.